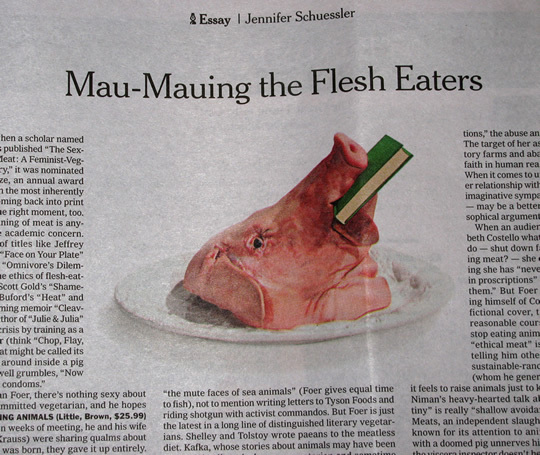 The above image of a decapitated pig went along with the New York Times Book Review's writeup of Jonathan Safran Foer's anti-carnivore polemic Eating Animals (Amazon ). 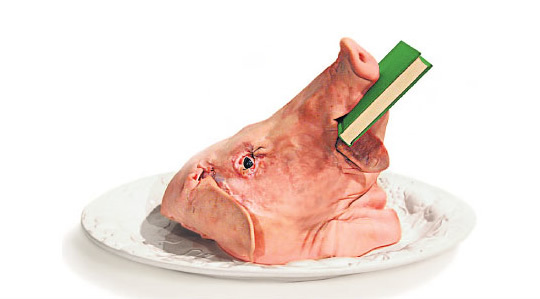 The caption reads "Illustration by Paul Sahre" but Joshua David Stein says that "a real pig's head was used." Anyone have a dead-tree version of the Book Review section? Please, send in a photo. Update 11/17/09: Nicholas Blechman, Art Director for the New York Times Book Review, tells us: "It’s a photo, but there was some tweaking in photoshop, so technically we have to call it an 'illustration.'"